Brexit vs. Grexit; the elite vs. the un-people. One just wonders who is who? With every day, the true face of Europe mirrors ever so clearer the abject inhumane colonial power that raped and usurped Asia, Africa and South America for hundreds of years, as so well depicted in numerous articles and essays by my friend, philosopher, historian and war journalist, Andre Vltchek. Every day this neo-colonial continent spits out new atrocities. And it’s getting worse. Sartre was right, when he said the US is but a Super-European-Monstrosity. The colonial Europeans, mostly Anglo-French Europeans, are at the helm of this monster-octopus, self-declared empire. They are behind the mysterious and Machiavellian eye on top of the pyramid on the US-dollar bill, the symbol of the Freemasons, the forefathers of today’s United States of America – and the driving force towards the New and One World Order. They pull the strings via such semi-secret organizations like the Bilderbergers, Trilaterals, CFRs (Council on Foreign Relations), Chatham Houses, WEFs (World Economic Forum) – you name it. Spineless individuals, like Bush, Obama, Clinton, Merkel, Hollande, Cameron – are mere vassals commandeering vassals; a construct that has grown so sophisticated and so evil – I’m sadly afraid, only eradication by war can stop it. And that is exactly what the Monster is preparing, by provoking Russia and China, encircling Russia with NATO planes, bombs and tanks, and encroaching on Chinese territories with war ships in the South China Sea – and with slander propaganda day-in-day-out against any sovereign nation that refuses to bend to the US super power. Then again, there is Hope, the life blood of our lives – that this evil tower of greed will collapse in itself by the weight of its sheer maliciousness, thereby reducing violence to a minimum. But collapse it must this criminal beast. It’s as clear as the pristine water that still flows from distant, uncontaminated springs, the hope for human survival. – It may take more than our lifetime to happen, but happen it will. It has happened many times before. May it suffice to watch the gradual decay of Europe by observing the current spectacle over Brexit – the Brits in the limelight for exit or no exit from the European Union. With all the fake theories and invented projections, the UK and European elite spreads around the globe, nobody really knows what they are talking about. … versus an almost forgotten and down-trodden Greece, destroyed by the same vile Machiavellian forces that sit behind the clandestine eye. Greece, also a European country, but not at par with the Great, Great Britain, the very lauded, praised and literally prayed-to by the cream of the crop of the rest of the western world — Greece, today is almost totally destroyed and what’s left is in the process and programmed to be devastated and looted by the same admirers of the ancient-new Anglo colonialists – murderers, exploiters, looters, rapists – which Greece never was. There is no term properly describing this still ongoing, perfected and legalized crime against Greece – and potentially against any other ‘misbehaving’ EU country. The people of the west are blinded by the massive killer propaganda funded by limitless billions of dollars made of thin air by the western liberated and too-big-to-fail predatory banking system. The top-notch politicians of France, Belgium, Spain and Portugal are no better. Against public will, they follow the orders of Washington and Brussels to the letter, enslaving and impoverishing tens of thousands of people by imposing austerity, producing poverty, disease and death. Spain, according to official statistics, is recording 11 suicides per day, of which at least half are directly related to the economic crisis, unemployment, desperation. Cancer rates have drastically increased since 2008. A study published in the British Lancet concludes that between 2008 and 2010 an additional 260,000 cancer deaths in OECD countries can be attributed to the effects of unemployment; 160,000 of them in the EU. Depression, loss of self-esteem and hopelessness are known to lead not only to suicide, but frequently affecting the immune system, thereby provoking cancer. This figure does not account for all the premature deaths due to malnutrition and lack of medical care and adequate shelter. New generations of peoples of neo-colonialist nations are being brainwashed into believing they are floating on the crest of the world, they are part of the elite, and, thus, are to perpetuate this killer system. These same elitists and their new generation ‘students’ lambast Greece for being corrupt and lazy, deserving what she is getting, when indeed corruption originates in colonialism. A country weakened and injured by financial guns, tanks and bombs, is being stomped into the ground. It’s the victim’s fault anyway. These are the values we have grown up with in our western world, the values we are passing on to future generations. Slamming Greece into oblivion is unimportant. But a possible Brexit – the Great British Empire leaving the corrupt EU – that would be a calamity. This fabricated event fills all the mainstream media – and takes Europe’s breath away. What a distorted and derailed world we are living in. What Greece has done for civilization, not just for the west but for the world – the invaluable intellectual wealth she gave us, is forgotten. Nobody thinks about it anymore. Democracy, grown out of the Oracle of Delphi, the epitome of a think tank for peace, if there ever was one – democracy, the voice of the people for justice and equality, is today meaningless. The term is used to cheat and deceive the people – the ‘We, The People’ – into believing they have a saying in what their governments are doing. In reality, we have a new world philosophy: Globalized neoliberalism, where peoples’ opinions don’t count. People are used as peons and cheap labor. Naked fascism in new shiny clothes. And like the sexual taboos of our monotheistic Christian culture, we are not allowed to see and recognize and talk about this new fascism’s nakedness. Solidarity is gone – long gone. Though, we are born with it. That’s for sure. But as soon as we push out of the sheltering womb, the evil fist of a greed-struck and greed-driven society grabs us and makes sure we never look back – back to the realm that we are all coming from – the realm of solidarity and love. The debate over Brexit by an elite that still adores the British Empire’s supremacy, while the same elite despises their southern neighbor, Greece, kicked and beaten into poverty, into horrendous suffering, but never, never into submission. Greece is vulnerable, Greece can be smashed. Its unimportant. It consists of un-people. Germany and the troika are doing the right thing – putting Greece and the Greek into oblivion. That seems to be the going opinion of many European leaders (sic). Many of these spineless politicians perceive sub-consciously that what they are doing may be back-firing one day. So, why are they not standing up, screaming ‘stop it!’ to the monsters of Brussels and Washington? Instead, the cowards who know about the wrong that is being done in their little remaining shred of consciousness, they allow the continuing looting and devastating of Greece. It is good ‘politics’. It is what’s called ‘political correctness’; and to belong to the elite, you have to behave as politically correct. What the Greek have worked for in millenniums of their history – a significant part of the life-capital of the world – is being pillaged and annihilated by self-proclaimed emperors of the universe – the corporate leaders of the New World Order, headquartered in Washington, Tel Aviv and London, with a succursale overseeing the vassals in Brussels. This is how Greece and the UK compare on the eve of the ‘crucial’ show-referendum, only a few days from now: Remain or Exit. The elite abides by the elite; debates the fate of the elite, as they want to be part of the elite – by association of intellect (sic-sic). Greece is not on their radar screen. – Who cares whether the UK Remains or Leaves? – well, leaving could be the straw that brings the EU down. And that would be a good thing. But does anyone really believe that Britain, the US mole in the European Union, is allowed to leave the EU? – To put it into context: The creators of the EU, who were not the Europeans, but America, the self-proclaimed winner of WWII – they will allow a Brexit only if they deem that now the artificial construct of usurpation, the constitution-less European Union and its artificial currency, the Euro – has lived its time and may now pass into the next phase, a feudal group of high-tech nations with low cost labor – with always the right number of unemployed – to be sustained by refugees of nearby wars and conflicts; the new serfs of the Washington-Tel Aviv based empire. When the Greek leaders on 5 July 2015 put the question of accepting or not the ‘troika’s’ financial sledgehammer, the Greek people decided overwhelmingly against the suffocating austerity. Then, somebody at Lucifer’s bidding put the gun to the head of the leaders and they, gutless as they are, disobeyed the decision of the people, the very people who democratically elected them six months earlier. Saying no to the austerity strangulation, would have meant exit from the Euro and possibly exit from the EU. It would have meant the salvation of Greece. But the masters of the universe – Washington, Berlin, Paris and London – couldn’t allow the southern, beautiful and proud Greece, the forefathers of our civilization, to become independent, autonomous and sovereign again. 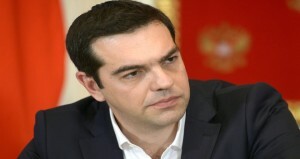 Greece, a strategic NATO position – no way can she get away. Few people seem to recognize the insulting threats against Greece of expulsion from the Euro and the EU by Germany’s Lord of Finance as the bluff they are. Greece is not allowed to leave the Eurozone, not as long as there are still public assets to be stolen; and less so to leave the EU. The Greek territory and strategic position is needed by NATO, the vassal-EU’s military command center for the protection of the global corporate empire. Hey – we are in the 21st Century Roman Empire of Bread and Blood – and are enjoying it too.